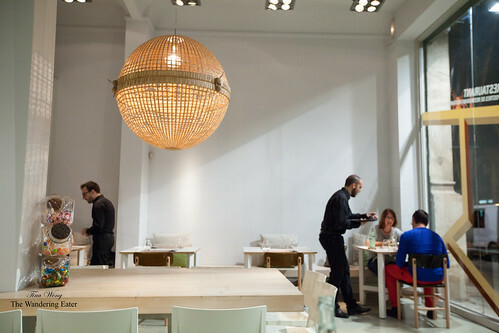 Espai Sucre in Barcelona means “Sugar Space.” It’s an intriguing restaurant and cooking school concept started by patissier Jordi Butrón. 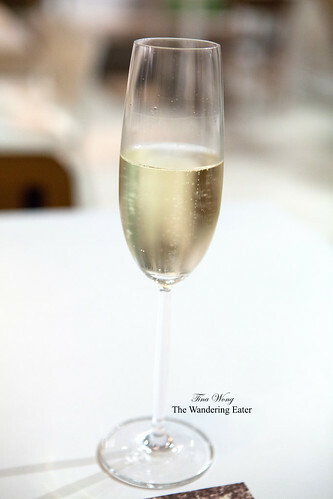 The menu is mostly devoted to tapas-style desserts that has a few savory dishes. The school aspect is teaches both the professional and amateur students. We headed here for dinner since we do adore desserts and their savory dishes does read tasty. Entering this minimalist decor dining room is a mix of Industrial (open steel racks containing glass jars of colorful candies and wine glasses and a metal framed banquette with upholstered cushions) and warm wood. 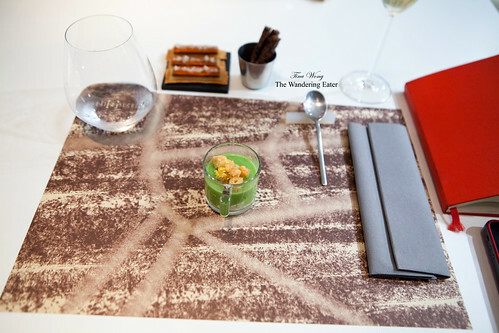 We started our tasting menu (50€) with amuses of warm cream of broccoli, cheese foam and mustard soup, black olive fennel sablés, and sopressata and honey cream with pear gelée on flatbread. The soup was creamy and the cheese foam and pungent mustard croutons added the needed texture and break up from the vegetal sweetness of the soup. The sablés were wonderfully crumbly and buttery with a nice briny kick. 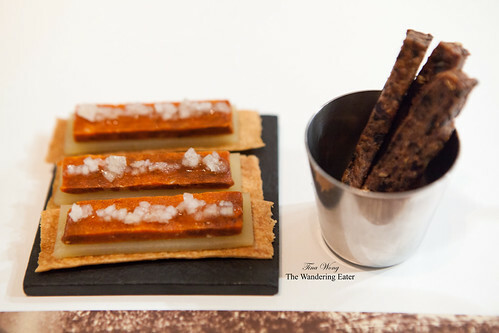 The cracker-like flatbread with spicy sopressata, super sweet pear gelée was sublime contrast of sweet, salty and spicy. 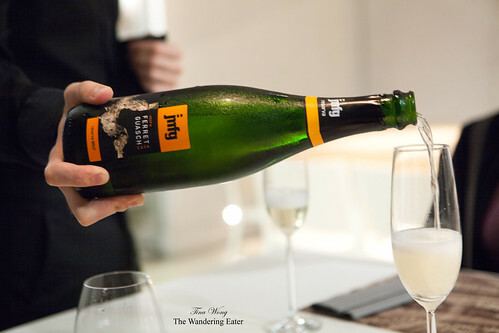 We drank a clean, crisp Josep M Ferret Guasch Gran Reserva Brut Nature Cava (28€ bottle) throughout our meal. Our first course of squid rice, passion fruit and saffron custard sounds weird but it’s very good. 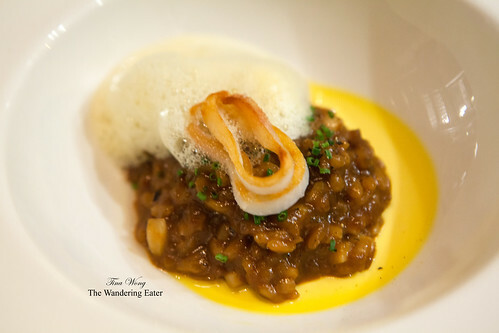 The creamy, risotto-like texture of the squid rice with the burst of tart passion fruit and bittersweet saffron worked. I liked the slight chewiness of the squid and even though the use of foam is for the most part very early 2000s it does lighten up the dish. 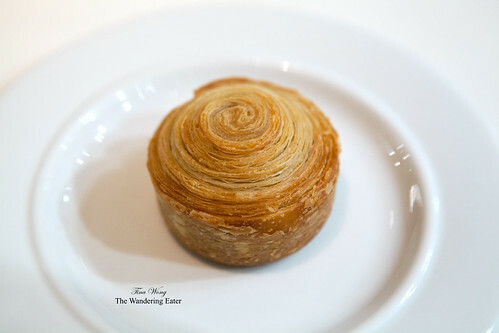 The butter bread served with this dish was unfortunately dense and oily rather than being flaky and buttery like a croissant. 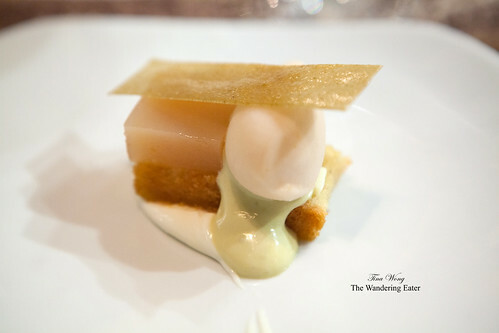 This San Simón cream cheese with extra virgin olive cake, white peach sorbet dessert was quite savory but it was delicious. I became very enamored with this particular cream cheese because it’s uniquely creamy, mildly sweet yet smoky cheese (that I even bought one back home from Formatgeria La Seu). The olive oil cake was wonderfully moist and fruity from the olive oil and the sweet white peach sorbet was creamy almost like ice cream. 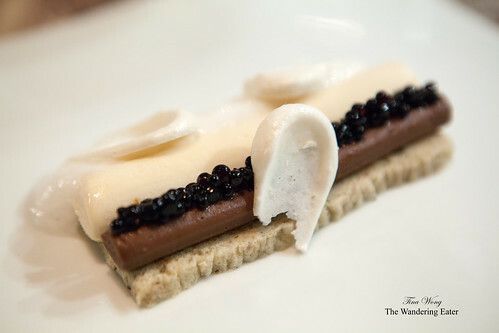 The next dessert of banana, chocolate, nutmeg and Pisco Sour foam was classic except for the creamy and crisp pieces of the tart Pisco Sour to brighten the earthy flavors. The final dessert of spiced hot chocolate with spiced ice cream baked in a cute (but very hot) mini enameled cast iron pot was what you’d almost expect for a spicy chocolate cake except the surprising chewy, jelly texture underneath the thin crisp, nutmeg flecked chocolate tuile and cold spiced ice cream. 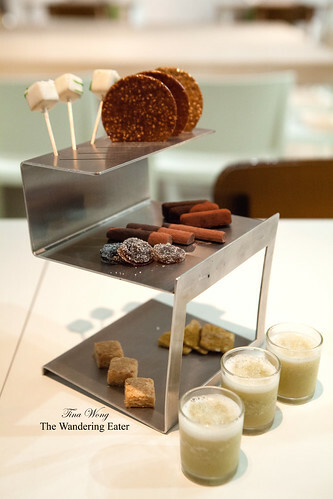 To cap off our meal, we were presented with an industrial style tier of petit fours. 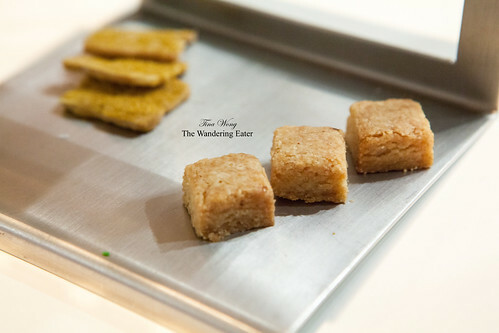 The lower tier has thick squares of salted butter shortbread and crisp peanut and curry cookies. 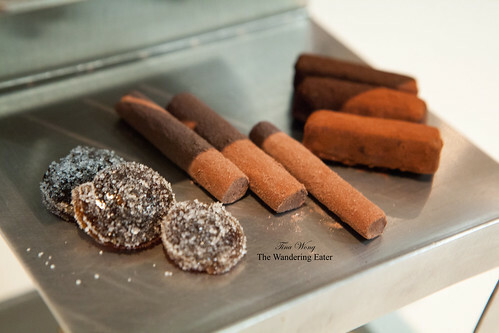 The second layer of coffee & anise pâtes de fruits, cocoa & green cardamom marshmallows, and smoked tea bonbons made with 70% cocoa kind of takes my palate on a sweet journey around India since there’s so much savory spices. 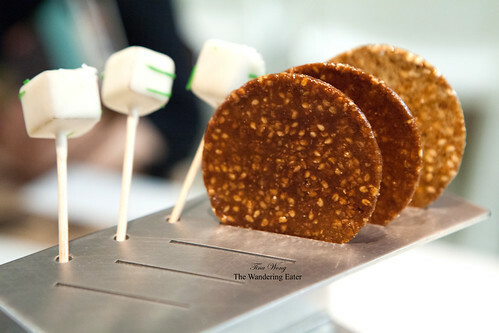 The top tier of lime and rosemary “lollipops” and sesame and licorice crisps were the sweetest items of the petit fours but it’s still a tightly controlled sweetness that doesn’t send us to the moon with sugar. 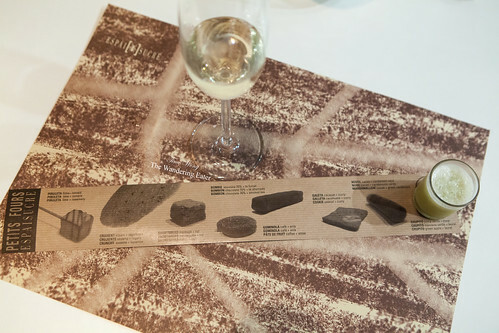 There was also a shot glass (chupito) of refreshing, icy blend of tart green apple and herbaceous laurel. 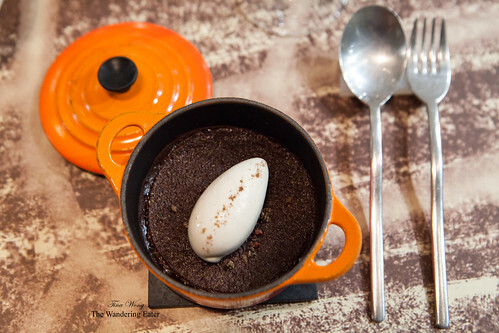 This place is good for unusual desserts that does blur the line of sweet and savory.